Hedgehogs are small, insect-eating mammals that can be found in Africa, Eurasia, southeastern Asia and Borneo, as well as New Zealand, where they were introduced in the 19th century. These animals are covered with prickly spines, which they use as a defense mechanism against predators by curling into a ball when threatened, making them appear to be a very painful snack. While the spines deter some attackers, certain predators are able to successfully hunt and eat hedgehogs, including birds of prey, several types of carnivorous mammals and snakes. Large owls, including the Eurasian eagle owl, commonly feed on hedgehogs. Both owls and hedgehogs are nocturnal, which means they rest during the day and are active at night. The Eurasian eagle owl, like many other species of owl, has the ability to flap its wings silently as it hunts, depriving the hedgehog of any chance to curl into a defensive ball due to the lack of warning noises. Several members of the Canidae family, including wild and domestic dogs, foxes, and jackals, may attack and eat a hedgehog. 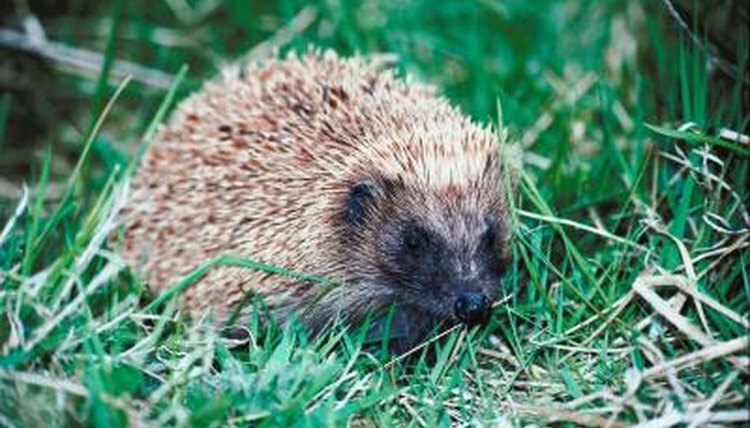 If the hedgehog has curled himself into a spiny ball, a dog may wedge his nose into the space where the edges of the curled hedgehog's coat meet in order to force the animal back open. Indian gray mongooses are known predators of at least one species of hedgehog, the Indian hedgehog. Mongooses are known for attacking unlikely prey suspects such as cobras, so it's no surprise that they use creative tactics to gain access to the prickly hedgehog, perhaps employing a technique they use to break open eggs: the desired prey is picked up with their forearms and thrown at a hard object in order to break a shell -- or shock and harm a hedgehog so much that he uncurls, allowing the mongoose to attack its soft underbelly. Mustelidae, the family that includes ferrets and weasels, are known predators of hedgehogs. A study of wild ferrets in New Zealand revealed that hedgehogs were a main source of food, and ferrets in Greece are known to feed upon hedgehogs as well.